PALM BEACH, Fla. – March 7, 2017 – Barrett-Jackson, The World’s Greatest Collector Car Auctions®, has a docket filled with coveted convertibles that will cross the auction block during the 15th Annual Palm Beach Auction April 6-8, 2017, at the South Florida Fairgrounds. South Florida’s premier automotive lifestyle event, Barrett-Jackson’s docket includes a convertible for almost every taste including a rare 2003 BMW Z8 Alpina (preview), an untouched 1971 Chevelle SS LS5 convertible (preview) and a 1967 Chevrolet Corvette 427/390 (preview). 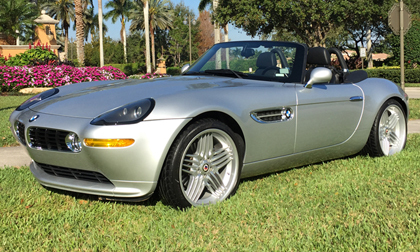 Among the convertibles crossing the Palm Beach Auction block is #336 of only 555 BMW Z8 Alpinas (preview) built in 2003. It features a full automatic transmission with all of the luxury amenities, including a factory flip phone, 6-disc CD and rack for the hardtop. With only 36,000 miles, it is a true collector convertible. Built by some of the best custom coachwork shops, a 1962 Cadillac Custom Convertible known as “Cadalina” (preview) combines the outstanding original body lines and space-age flavor of the original car with modern presence and function. The subtly modified Cadillac body features a Mediterranean Sea Blue and Pearl custom paint finish. The chassis is equipped with RideTech air suspension, including Shockwave aluminum air shocks and General Motors disc brakes. Under the hood is a 5.3-liter LS V8 engine and a GM 4L60E overdrive automatic transmission. Also included in the convertible lineup during the Palm Beach Auction is a stunning 1971 Chevrolet Chevelle SS Convertible (preview). An impressive example of an untouched, all-original Chevelle, this rare muscle car features almost every option available in 1971. Features include a black power top, Turbo 400 automatic transmission, F41 suspension, factory air conditioning, AM/FM radio, power steering, power disc brakes, glove box light, ZL2 cowl induction, tachometer and gauge package and bucket seats with horseshoe shifter. An exceptionally restored Rally Red 1967 Chevrolet Corvette 427/390 Convertible (preview) headed for Palm Beach is powered by a 427ci turbo-jet V8 that cranks out 390 horsepower. Other features include red vinyl bucket seats, Rally wheels with red line tires, side-pipe exhaust and AM/FM radio. The original owner’s manual, protection plan booklet and Chevrolet Order Copy are included. Other notable convertibles crossing the Palm Beach Auction block include a1956 Chevrolet Bel Air Convertible (preview) finished in Sierra Gold poly with Adobe Beige, a 1988 Rolls-Royce Corniche II Convertible (preview) with only 41,000 original miles and a 1957 Thunderbird Convertible (preview), which includes complete documentation of the frame-off restoration. The 15thAnnual Barrett-Jackson Palm Beach Auction will be broadcast on Discovery, Velocity, Velocity Canada and Discovery Turbo UK during the three-day auction. For specific television schedules, please click here.